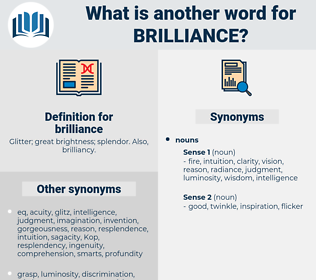 What is another word for brilliance? Glitter; great brightness; splendor. Also, brilliancy. genius, engineering, ingenuity, skill, light. 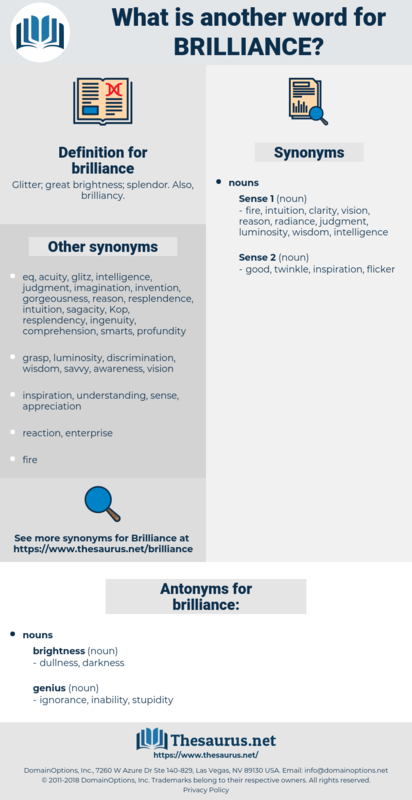 brightness, luster, luminosity, talent, glow, shine, intellect, glare, intelligence, verve, Genie, gloss, sliver, shard. cloudiness, grayness, lackluster, gloominess, dimness, obscureness, haziness, colorlessness, murkiness, obscurity, duskiness, somberness, blackness, shadowiness, paleness, dark. Seven toes he has on each of his feet and seven fingers on each of his hands and the brilliance of a very great fire is around his eye. The ceremony went with its customary brilliance until that point when the bridegroom was required to say: " I, Edward, take thee, Adela Constantia."